These are the information (digital) products I have for sale. If you’re looking for the services I provide, please click here! 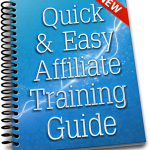 Quick & Easy Affiliate Training Guide – Answer new affiliates questions before they even ask with this Step-by-Step Affiliate Training Guide (with PLR Rights)! This training guide is jam packed full of easy to understand information that will make your affiliates appreciate you being a step ahead of them and warding off questions before they even have time to ask them. It will help your affiliates gain the knowledge needed to successfully promote you! Outsourcing Success – Overcome daily task overwhelm with advice from both sides of the outsourcing equation: find out how successful business owners increase their bottom line by turning the busy work over to a smart service provider. Coffee Cup/Laptop Stock Images – Grab this package of 35 images I took and am selling as stock images. You can use them as is or modify however you wish. The fun thing about these images is that they’re not just your boring ole laptop and coffee cup pic. I’ve spiced them up with some personality and fun! 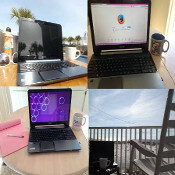 Several of them were taken during a biz event in Pensacol Beach, Florida so you’ll find some by the pool, some on the porch filled with sunshine in the background and palm trees all around.